Jari is the number one LED specialist at Arrant-Light. Jari has been working with Citizen LED since 2008 and is responsible for everything related to Citizen COBs or SMDs. 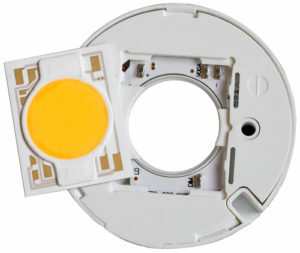 AC COB is brand new AC LED solution from Citizen Electronics. It is available with holder which contains necessary components to connect package directly to mains voltage. So basically it is designed to make life of luminaire manufacturer easier. 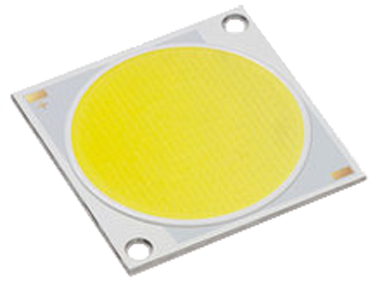 AC COB has integrated circuit which allows you to control luminous flux more accurately. For all CCT and CRI versions you are able to have exactly same luminous flux from the package e.g. 750, 1000, 1500 and 2000 lumens. 5 volt output enables you to use e.g. motion sensor, so you can easily adapt external sensors to easily add features to your luminaire. There is no additional losses from driver and so there is no problem to have good efficacy even with low powers. AC COB with new integrated circuit has good compatibility with dimmers, you are able to dim this solution with Triac (leading-edge) and Transistor (trailing-edge) dimmers. Small form factor and no need for external driver allow even more creativity to luminaire design. There is no need to worry where to place the driver. What you need to take to consideration? AC COB has of course similar characteristics than normal COB meaning warmer CCTs have lower efficacy than cooler CCTs. With fixed luminous flux, that means you have difference in power. So 2700K Ra90 AC COB consumes more power than 5000K Ra80. And of course AC is still AC. If you don’t use more complex circuitry to modify AC to DC, you will still have AC characteristics affecting luminous flux. Mainly with AC LEDs this means that you have flicker present in light source. To reduce that effect, it is good to consider e.g. secondary optics which lower this phenomenon. Even though AC LED might have it’s limitations it has certainly some advantages which make it viable solution as light source. It has ENEC certified components which are easy to use to design new luminaires and you can make testing with this solution in different luminaires. Now it is time to consider where you could use AC COB to realize its advantages. You can download datasheets and brochure from the button below. This entry was posted in AC COB, COB and tagged AC COB, COB on 14.02.2017 by Jari Jokelainen. 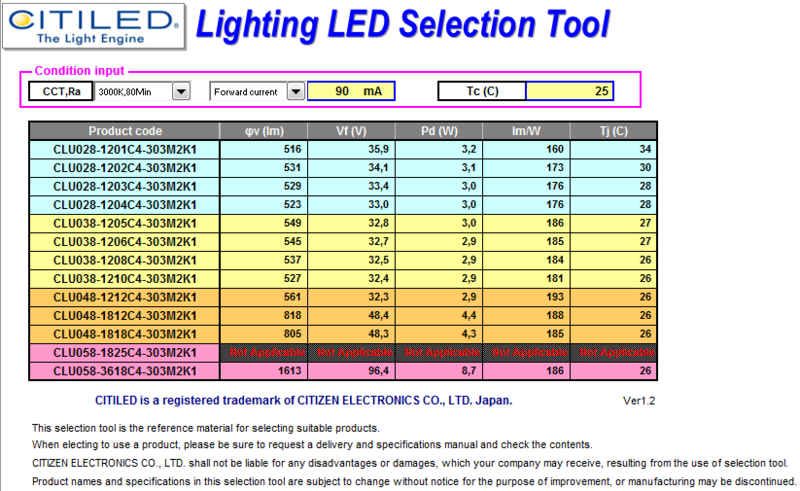 Citizen COB LEDs generation 6 – What is new? 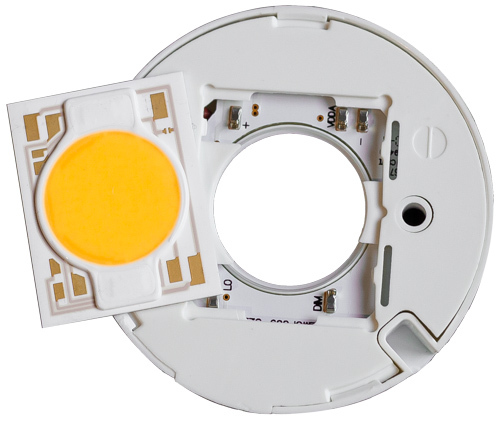 Citizen have released generation 6 from their successful series of Citizen COB LEDs. In this post I’ll go briefly through, what is new and what advantages these COBs have compared to previous generations. Performance will up to 7% depending on CRI of LEDs. There will be also slight decrease on forward voltage, which increases lm/W efficacy on LEDs. MacAdam 2-step binning will be an option in new generation. Although we have had very tight 3-step binning already, there is now option to order also 2-step versions of COBs. So if you desire to have 2-step SDCM COBs in your products, we have now solution for that. Thermal resistance is further decreased from generation 5. Decrease from generation 5 is 5% and from generation 4 even 38,5%. This allows you to minimize your need for heat dissipation. Another option is that you can create new, bigger lumen categories with your existing products. On the left a heat sink needed for COB Gen 4 LED. On the middle heat sink needed for gen 5 LED. On the right, heat sink needed for COB gen 6 LED. The power of the LED is same in every case. Maximum Tc-temperature has been set to 120 degC. Allowable Tc-temperature will rise from 105 degC to 120 degC. This will help you to maximize light output from your design, so you can use smaller heat sinks to get more light. You will be allowed to have higher Tj-temperature than in previous generations, so maximum Tj-temperature will be now 150 degC. This will give you wider LED driving options especially with bigger COB packages. Citizen COB LEDs continue to increase their performance and offer amazing coverage for lumen packages. Packages range from under 100 lumens up to 60 000 lumens from single light source. If you haven’t yet tried Citizen COB LEDs, now it is good time to learn why Citizen has been top player in the industry for so long time. You can download the whole catalogue, datasheets and simulator tool for Generation 6 COBs from our website. This entry was posted in Citizen, COB, LED on 31.01.2017 by Jari Jokelainen. 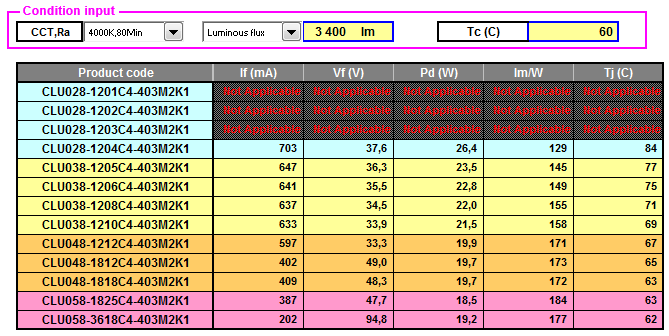 Datasheets are essential part when you compare how different light sources work in your solution. Usually it can be time taking and exhausting to glance at datasheet and find values you are looking for. This gets even harder if you have multiple LEDs or different LED packages, which would mean that you have look at multiple datasheets to get different values. This is the reason why Citizen has created a Citizen LED simulator. The simulator is very easy to use and makes comparing different LED packages a lot easier. If you haven’t yet tried it or you don’t have the simulator, you can download it for free from our website. Citizen LED simulator basic view. Follow these steps to use the simulator. You can choose desired CCT and Ra and selection simulator shows packages and product codes of existing products. First you need to select desired CCT and Ra from condition input field. You can choose desired CCT and Ra and the selection simulator shows packages and product codes of existing products. After you have selected color temperature and CRI value, you can choose between driving current (forward current in simulator) or desired luminous flux. Then you can input Tc-temperature. If you have no idea how much Tc is or would be in your solution, values around 60 degrees are realistic to use as many light sources reach temperatures close to that while being used. 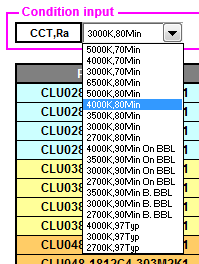 In this example, I have chosen that I want my LED to be 4000K, Ra80 Min. And I want to see what options we have to get around 3000 lumens out from luminaire. Luminaire optics etc. will drain around 300-400 lumens in my solution. So I have determined that I need 3400 warm lumens from LED and estimated that Tc-temperature is 60 degrees. I can see that I have ten different LED packages I can get the 3400 lumens from. In first column after product code you can see what current you should use to get these values. If you don’t have LED driver, in which you can choose output current, it is recommended to then select current value you have LED drivers available in. In this case, 700mA seems to be a good choice as many of the LED’s have driving current close to that. So I change “forward current” instead of “luminous flux” from the condition input and insert 700mA. LED packages which give you desired lumens with 700mA. We still have six options to choose from. This will give me a list of LEDs I can use with 700mA driver. And more importantly give me a good overview of LED packages that can give me my desired lumen amount. If you have problem that you can’t find driver with suitable current, you can contact me for help. In this case, CLU028-1204 would suit my lumen need quite nicely and CLU048-1212, would probably be an overkill for this application. All the other options, might suit my solution although they give roughly 10% more lumens. Whether this is ok, depends really on my application and desired efficacy. Citizen LED simulator is also powerful tool to use when you want to see easily how much lumens you get when driving LED with different currents. Good example is that if you have LED driver which has different current options and flexible LED package, you can use only two components to realize many different lumen packages. As an example I did this exercise with ELT 42W multicurrent LED-driver and Citizen CLU038-1205 LED package. This driver has option to select different driving currents with dipswitch. If we take Esko’s advice and look from driver datasheet, we can see that output voltage area is suitable from 500mA to 1000 mA. 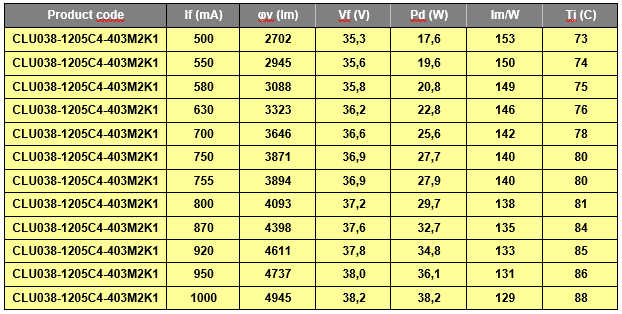 Below you can see LED characteristics with different current. I have also added forward current column to make this table easier to read. Tc temperature is 60 degrees in all cases. Table with CLU038-1205 4000K Ra80 LED from 500mA to 1000mA. You can also use the LED simulator to estimate the amount of lumens lost due to your luminaire (optics etc.). If you measure LED Tc-point and input the driving current you use to simulator, you should have pretty good estimation that how much lumens you should get out from your luminaire. If you find out that the loss is too big, the you can either change the LED to a different package or improve the optics of your luminaire.As you can see, you can use this driver & LED combo for a luminaire from ~2500lm to ~5000lm. You can download the latest simulator below. This entry was posted in Citizen, How to, Tool and tagged Citizen, How to, LED, simulator, tool on 16.08.2016 by Jari Jokelainen. Why the Same Color Temperatures Look Different? We see more and more light sources that supposed to be exactly the same color temperature, but actually appear different to human eye. So why the same color temperatures look different? When people talk about color temperature, they are usually talking about correlated color temperature instead (CCT). There is a difference between these two. Color temperature (CT) defines what is the exact spot of the light source is on the planckian locus line. This line in pictured in the below image as the black line in the middle. So if there are two light sources, that have a color temperature of 4000K, they both look exactly the same as they both are on the same spot. Correlated color temperature is used when the light source is off from the planckian locus. If CT defines the exact point on locus, then CCT defines the perpendicular line which runs directly through that exact point. So if a light source is off from the locus, then CCT is the CT point which is closest on the locust. So for example if a light source has a CCT of 4000K, that means that it can be on any point on the line that runs through the 4000K point on the locus. You can see these lines on the image. Typically a light sources color temperature is announced as CCT. So if it is said that two light sources have a CCT of 4000K, this means that they are on the same line that runs through the 4000K spot, but may, in fact, look totally different. Usually, light source’s chromaticity is defined in diagram as chromaticity coordinates. In this diagram, you can’t determine that CCT is the shortest distance to the locus. 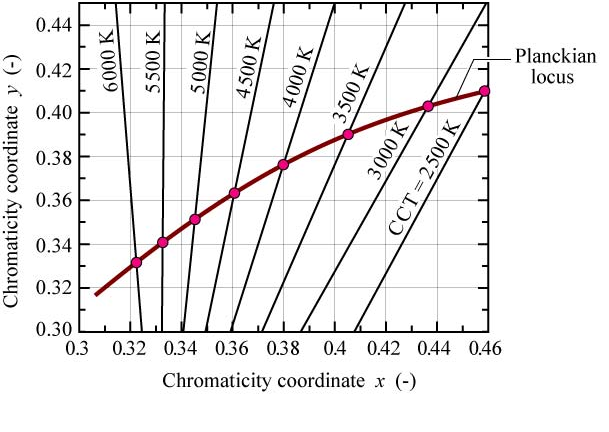 You can see the chromaticity diagram in the image below. So when you have three luminaires which have the same 4000K CCT, you can have three totally different colored lights. If the light has a greenish white light, that will mean that the chromaticity coordinate is above the planckian locus. If the light has a purple tone, then chromaticity coordinates are below the locus. If the light is normal white light, then the chromaticity coordinates are on the locus or at least very close to it. So please remember that staring at the CCT doesn’t always tell you everything. If you use two different light sources with the same CCT, you should always check the coordinates and see if these two are actually the same color. This entry was posted in LED, Technical and tagged cct, LED, Technical on 13.04.2016 by Jari Jokelainen. 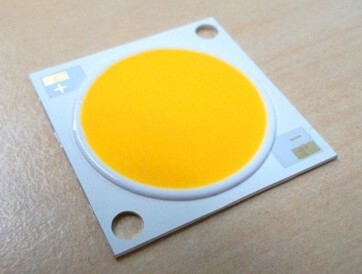 COB LEDs are very popular nowadays in LED lighting business. We talk and write about COBs, and our customers use COBs in their luminaires, but what exactly is COB? First of all, the abbreviation COB comes from words Chip-on-Board. 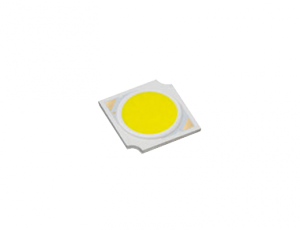 In COB packages many LED chips are usually attached to substrate with non-conductive adhesive. LED chips are wire bonded together to make different LED setups. 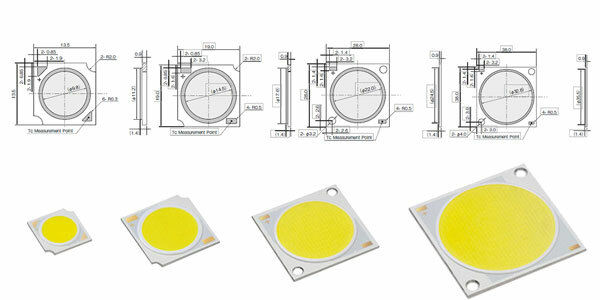 The amount of single LED chips, inside a one COB LED package, can vary from few pieces up to several hundred pieces. Substrate is located on base material. Base material of COB LED is usually MCPCB or ceramic PCB. COBs often have blue diodes and use yellow phosphor layer to convert light to desired color temperature. 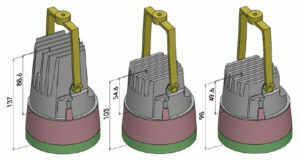 General drawing of a COB LED. Also there was very little experience of COB LEDs, so these LEDs had a lot to prove. Although now several lifetime tests have shown that COB packages are very reliable, if heat management is done properly. When thinking about heat management, one important feature is thermal resistance. But it is worth noticing, that you can’t define which COB LED is better to conduct heat just from thermal resistance value. You should actually test LEDs in your own application. almost every light source can be replaced with COB LED. So available powers go from few watts up to almost 200 watts. The most powerful COBs require exessive heat sinks because they generate a lot of heat. COBs offer great variety due to possibility to have many different LED setups even inside one COB package. Usually LED manufacturers have different lumens packages available in same size COB, so lighting manufacturers is able to use e.g. same connectors and optics in different solutions. Also it is good to remember that usually you can underdrive or overdrive COB LEDs and those might have quite wide driving range. This allows you to drive LEDs with very high efficacy, you can make balanced solution or you can make economical lumens. COB LEDs are generally used in luminaires where lamp or single spot light sources have been used. So basically COB LEDs are used in almost every kind of luminaire. Although COB LEDs are used less often in linear lights or panel lights, some solutions of that kind have been made with COBs. Luminaires which have really high luminous flux are usually made with more than one COB LED to distribute heat flux and to ease design of heat sink. COBs offer very high luminous fluxes from small size packages and thus allow flexible design of luminaire. 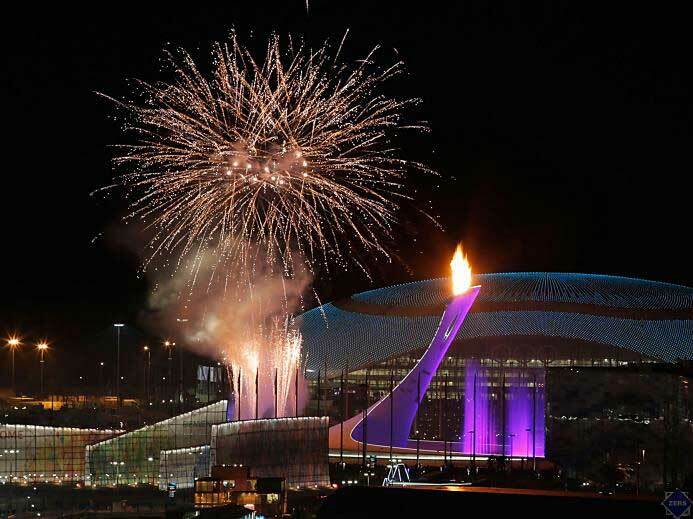 This gives you more freedom, when designing a luminaire. COB packages usually have excellent uniformity of light from light emitting surface, this is important e.g. if you want to avoid multiple shadow effect, which might occur with SMD based solution. It is also very easy to test COB LEDs. You only need COB LED, constant current driver and e.g. 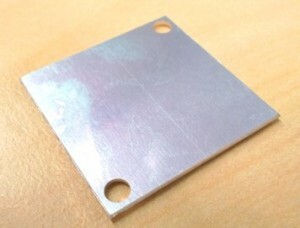 piece of aluminium, which can be used as heat sink. We can see that COB LEDs have been very important development step in LED lighting business. This great package design has allowed to increase powers used inside one LED package tremendously. Also one good indicator of success of COBs is that today every major LED manufacturer and package maker has COB LEDs in their selection. If you wish to receive updates on our products in monthly basis, you can subscribe to our newsletter by clicking here. This entry was posted in Citizen, COB, LED and tagged Citizen, COB, LED on 13.02.2015 by Jari Jokelainen. Citizen COB LEDs generation 3 – What has changed from the last generation? Citizen has released brand new generation 3 COB LEDs. Is this post I go through briefly what changes and advantages this update brings to Citizen LEDs. First thing which is noticeable with new LEDs is that product code changes from e.g. CLL022 to CLU024. Third letter has been changed to ‘U’ to inform that generation 3 COBs are UL recognized components. Citizen has managed to improve LED performance significantly in generation 3 products compared to the last generation. One of the main updates has been done to package performance, which has allowed better light extraction from generation 3 LED package. Other main update has been in LED die inside package. These new LED dies do not allow only better performance, but also give you the possibility to have even wider current range used with LED. In practice this means 50% wider overdriving range compared to generation 2 LEDs. What is the best about these generation 3 packages besides great performance improvement is that outlines and mechanical dimensions remain the same. So you can easily update these new products to your existing luminaire designed for previous Citizen LEDs. This also means that all the accessories designed for previous versions still work with new LEDs. When you are considering update from generation 2 to generation 3, please keep in mind that most probably you will find four suitable options from generation 3 LEDs to replace your existing LED. Generation 3 will give you much more freedom to choose from significant improvement in efficacy, getting balanced performance update or getting economical lumens with same efficacy. If you need help in the selection, I will be happy to help you. Citizen has also increased minimum color rendering index for generation 3 from Ra65(min) to Ra70(min). These Ra70 products allow very high lumen output with excellent luminous efficacy. 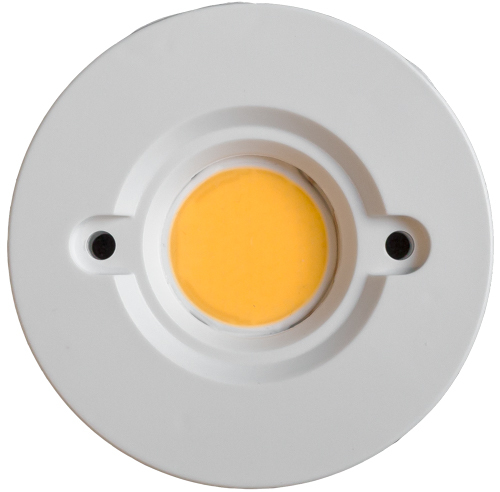 This also allows wider usage of high efficacy LEDs in places where Ra70 is minimum requirement. If you have some questions or comments about Citizen LEDs, please contact me directly or comment below. This entry was posted in LED, Uncategorized on 26.08.2014 by Jari Jokelainen.